By Molly Sabourin 187 pgs. 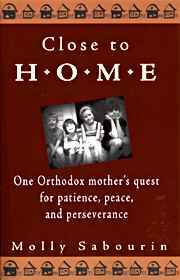 Close to Home: One Orthodox mother’s quest for patience, peace, and perseverance. Close to Home is for every young mother who’s ever wished children came with an instruction manual . . . who’s ever wondered why ‘happily ever after” takes so darn much work.